I admit it -- I've been neglecting this blog a bit lately. Blogging, my weekly ritual, has recently become an if-I-find-time activity, and for a couple of reasons. For starters, it's been competing with the Spanish language, as I need to pass a UN Spanish test according to the new hiring rules of my workplace (note: I haven't given Spanish much thought since I graduated college in 2011, and fervently wish they'd test my Italian instead). Much of my time has been occupied by a combination of private lessons and copious amounts of homework (tarea) and while I'm happy to dust off (desempolvar -- okay, I'll stop now) my Spanish, it's time-consuming. Work in my new division is intensely busy, visitors, as welcome as they are, have been non-stop (a post on that later, when I find the time!) and the weather has been so spot on lately that any free time I have is spent outside in cool places like this one. PHEW. 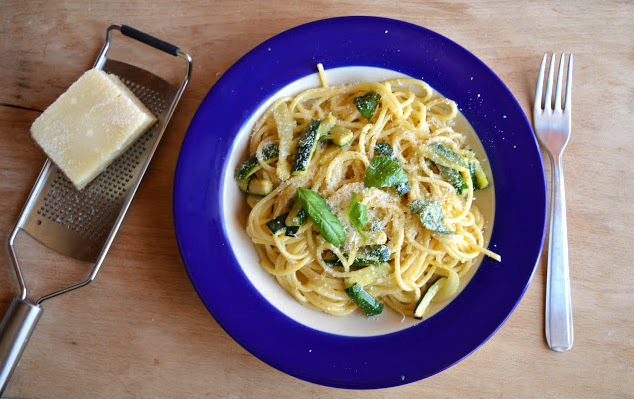 With such little time to cook and write, I knew I'd have to use my precious free time very wisely, and I was certain that this pasta recipe -- from expat blogger and cookbook author Rachel Roddy -- would never in a million years disappoint. If you're not familiar: every Roddy recipe is spot on, perfectly seasoned, positively delicious, and if I was going to write about one recipe in the next week, I knew this one would be a very, very safe bet. (Spoiler, I was right). So! This recipe is reminiscent of the beloved and well-known Roman classic, pasta alla carbonara, but with a few serious distinctions; think of this as carbonara's distant, vegetarian cousin. Still present is the ever-classic spaghetti, lots of freshly ground black pepper, and the addition of a beaten egg that is cooked quickly with the heat of the pasta to form a sauce -- from there, however, we swerve off the beaten path into a different sort of pasta dish, one where vegetables take the place of traditional guanciale, the more approachable, familiar Parmesan nudges the classic Pecorino out of the race, and there's the addition of a little bright basil. 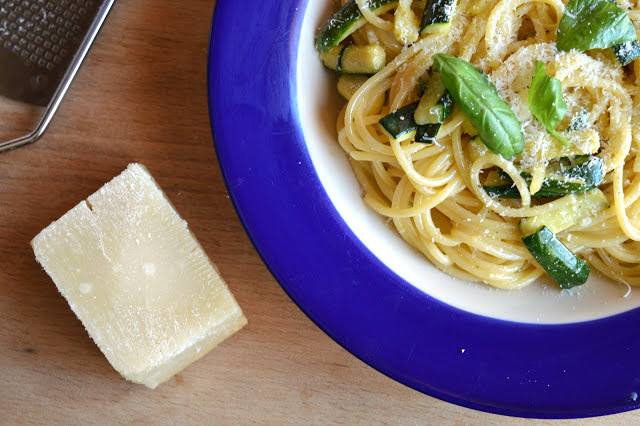 The resulting dish manages to be luxurious yet still strangely light -- think of this as comfort food, summer edition -- with a silky, luscious sauce, sweet summer-y onions and zucchine, and a sunny sprinkle of synonymous-with-summer-basil. A dish of this is downright perfect with a little extra Parmesan grated over the top, eaten forkful by twirly forkful as you review the subjunctive, or speak to yourself out loud in Spanish, or whatever it is you choose to do. Bonus: this is a great use of all that mind-bogglingly abundant zucchine (or zucchini as we Americans call it) that will be taking over your garden this season. Just saying. A couple of notes: You could very easily substitute another vegetable for the zucchine here -- peas or asparagus might also be nice. The addition of pancetta or guanciale to make this a little more carbonara-y would be delish, and I have a feeling you could easily swap the Parmesan for Pecorino if you'd like. I used spaghetti here but Rachel's recipe actually uses linguine; any long pasta would probably work here. Grate the cheese with the smallest grate of your cheese grater. Lastly, be sure to cook the zucchine and onion over low heat, slowly, so they soften and cook but don't turn brown. Looking for other recipes with zucchine? I've got this Zucchini, Corn, and Tomato Pie, this Three Cheese Zucchini Tart, and these Stuffed Zucchini. 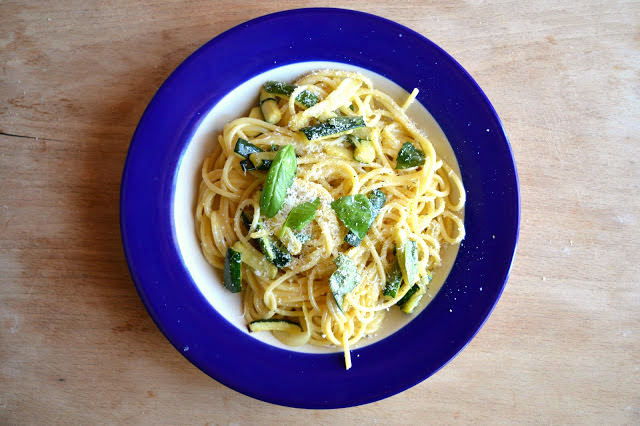 Looking for more summer pastas? I've got this Spaghetti with Cherry Tomatoes and Basil, this Sundried Tomato Pesto, this Classic Basil Pesto, this Pasta with Swordfish and Eggplant, and this Pasta with Eggplant, Tomatoes, Basil, and Mozzarella. Put a large pot of water on to boil. Next, start with the veggies -- peel and then thinly slice the onions, then cut the zucchine in to strips (about 5cm long and 2mm thick, to be precise). In a large frying pan, heat the olive oil (medium-low heat) and then cook the onion and zucchine with a pinch of salt, being sure that they don't brown; you want them to be softened and cooked but without much color. This will take about 10 minutes. Remove the pan from the heat and set aside. Once the water is boiling, add some salt and then add the linguine. Cook until al dente (about 7-9 minutes usually, check the package instructions). 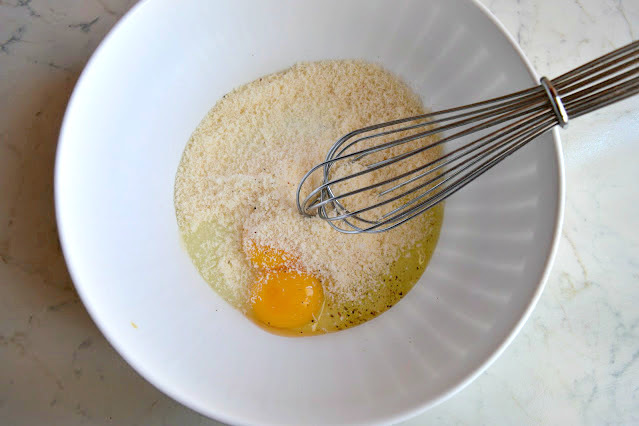 As the pasta cooks, whisk together the eggs, egg yolks, cheese, a pinch of salt, and some black pepper, and set aside. As you approach the end of your pasta cooking time, heat up the pan with the zucchine, onion, and olive oil again, until they're thoroughly warmed throughout. Once your pasta has achieved al dente status, drain it, being sure to reserve a bit of the cooking water beforehand. Add the pasta to the frying pan and toss and stir it to mix it with the vegetables. 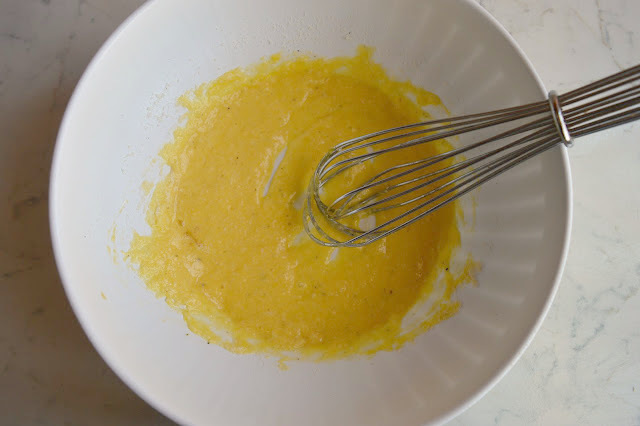 Turn off the heat and, working quickly, add the egg mixture and a bit of pasta cooking water, then stir and swirl the pan vigorously until each strand is coated with a nice Parmesan-y egg sauce. Add a little more pasta cooking water if needed and stir again. Rip the basil up, toss it into the pan, and stir again. Serve immediately with some freshly grated Parmesan on top, if you'd like. Serves 4.